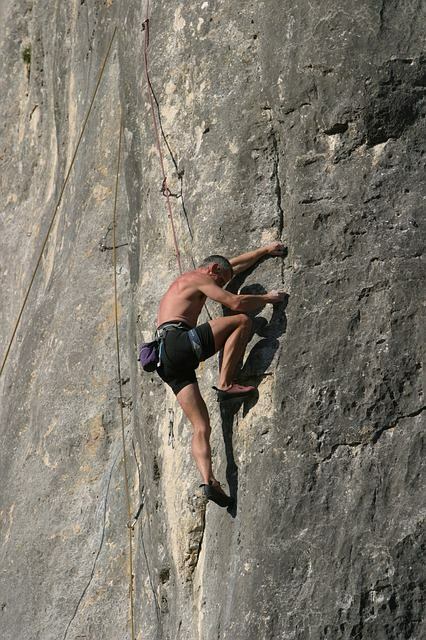 Rock climbing is one of the most physically demanding activities available to civilians. It is also starting to get popular. So it is no surprise that more and more people want to get into rock climbing. However, the activity requires one to be of sound mind and body, so a proper rock climbing workout is needed. This way, you can get a proverbial running start when you take your first step towards the Joshua Tree National Park. You need 4 sets and 10 repetitions of pullups. It is best to do this with a thumbless grip, as it will help increase your forearm and grip strength. If you are not familiar with this exercise, it is basically a pushup where you raise one knee to its corresponding elbow, and then do the same for the other side, alternating each rep. This exercise is designed to work out the obliques and triceps. This may be the most important part of this climbing workout, because it helps boost your stamina while strengthening your legs and core. It is done by doing burpees with one leg raised off the floor the entire time, including the jump at the end of the movement. You need to do 2 sets with 10 repetitions for each leg. This climbing workout is done by lying on your back, while stacking your right foot on top of your left so the heel of your right foot ends up on top of the toe of your left foot. Then while keeping your legs straight, you raise both legs quickly and press toward the ceiling, with a little bit of twisting to the left. Finally, you bring your legs down with a five count. Complete each side with alternating legs. This climbing workout requires 2 sets of 14 reps for each side. As for how frequently you need to do this exercise, it is best to base it on your normal workout schedule. Try to fit it in if you don’t have similar routines in your regimen, but try to make alterations if possible – the Single Leg Burpee, for instance, can replace a normal burpee in your routine. Of course, as physically and mentally fit as you can be, it will not make up for lack of experience. If you are a novice rock climber, you should get an experienced rock climbing guide to accompany you on your trips. Contact Uprising Adventure Guides and we will pair you up with one of our expert guides.